As much as I enjoy turkey and ham, what I’m really after on Thanksgiving Day is the sides. I love stuffing, potatoes, Grandma’s pistachio salad, and rolls. Oh, the rolls. 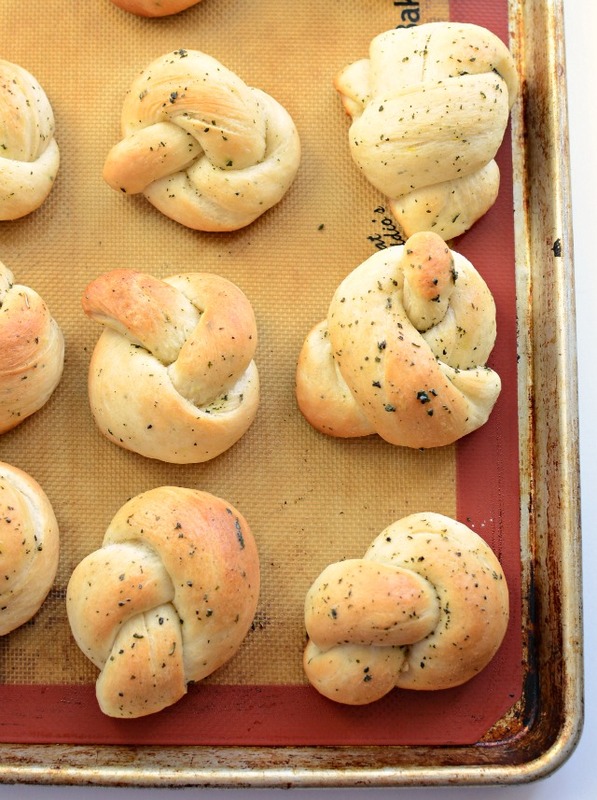 These garlic knots are wonderful and pretty… perfect for Turkey Day or to accompany your favorite soup this week. Today is October 12th, and that means 12 Bloggers, 12 recipes, 12 ingredients or less. And the topic? 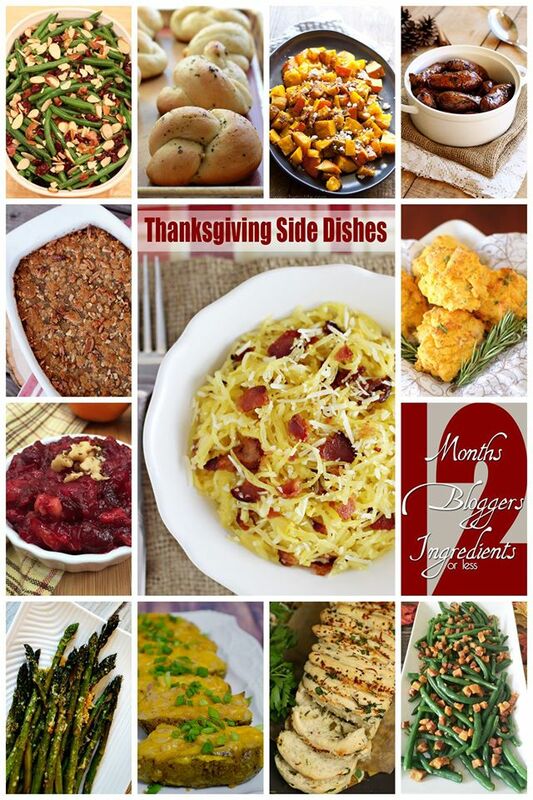 Thanksgiving sides! Timely indeed, and things are looking delicious. The links to the other recipes are at the bottom of the post. Enjoy! 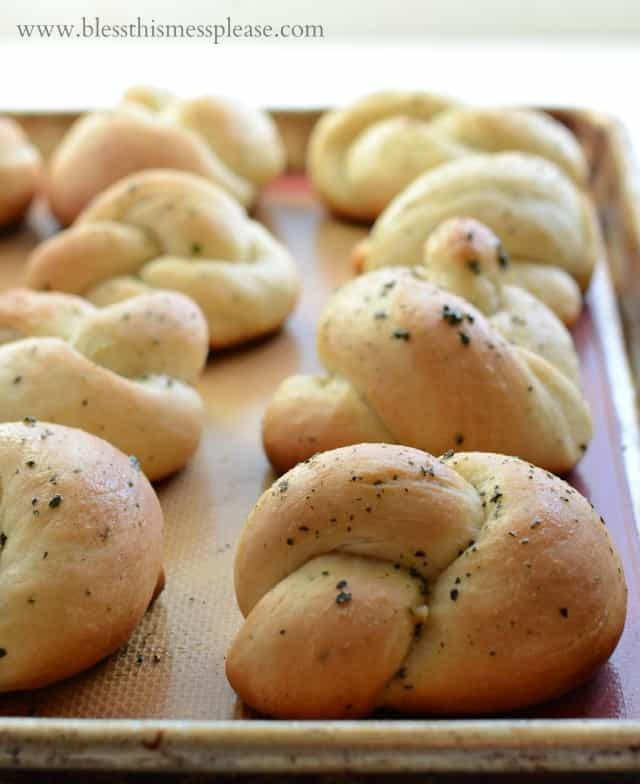 Here’s what I love about garlic knots: they are super buttery and have a lot of flavor. They don’t need any additional butter or jam, so it makes them easy to take with you to dinner or to serve to a lot of people. Just pop them in a bread bowl and they’re ready to go. Plus they are a little different than usual and feel a little fancy. I kind of like fancy now and again. No matter how you cut it, these are tasty. In a large bowl add the warm water, yeast and sugar or honey. Stir to combine and let the mixture rest for 5 minutes. Add the oil, salt, spices, and 1 cup of flour. Stir until well combined. Add 2 more cups of flour and stir until combined and the dough starts to pull away from the edge. Dump the dough out onto a lightly floured surface and knead until smooth and elastic, adding additional flour as needed. Knead for 3 or 4 minutes. Place the dough back in the bowl, cover it, and let it rise for 30 to 40 minutes. After the dough as risen remove it from the bowl and divide it into 12 equal parts. Roll each piece of dough into an 8 to 12 inch long rope and then tie the dough into a simple knot (make a circle with the dough and stick one end through). Place the dough knot on a parchment or baking mat lined baking sheet. Repeat with remaining dough. Cover the dough knots and allow to rise for 40 minutes to 1 hour. Preheat the oven to 350 degrees. Brush the top of the dough knots with the butter and spice mixture and bake for 15 to 20 minutes until the tops are golden brown. Remove from the oven and brush the tops with the butter mixture again. Serve hot. I spy with my little eye… a missing roll! So good that I couldn’t stay out of them long enough to take a picture of all dozen. Oops! Here are the other ladies’s recipes too. Making this girl hungry! 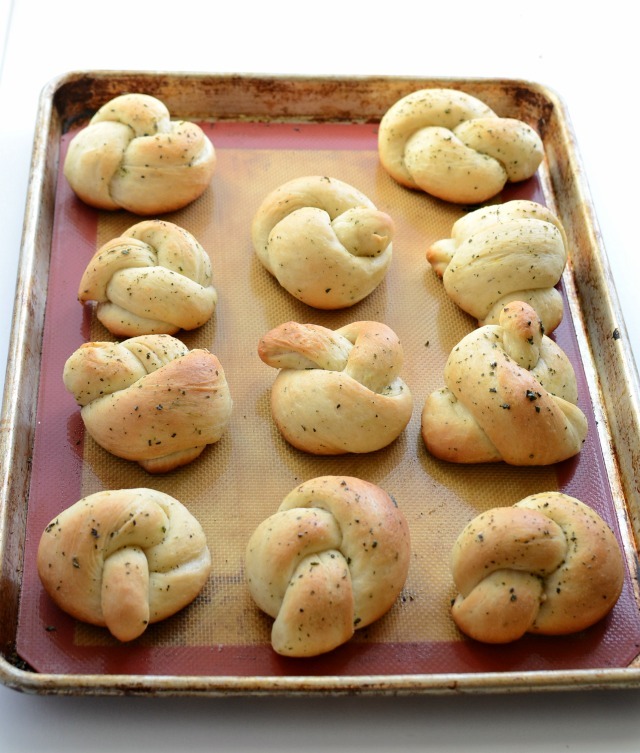 These garlic knots sound so delicious, I can’t wait to try them! I’m making these today, for Thanksgiving tomorrow. And if they turn out as good as I think they will, I’ll make two fresh batches in the morning. My family Thanksgiving includes 31 people when everyone can make it. We will have 29 there this year so I’ll have to just about quadruple this recipe to feed them all, but a good knot recipe is worth it!!!! 🙂 thanks for sharing your great recipes! Yum! Did they work out?! Yes! They were awesome and everyone raved about them. I made four batches and there weren’t any leftover. 🙂 Thanks for another great recipe!!!! Yes, they were delicious and my family had them gone in under 5 minutes! Thanks for sharing the recipe. Yes! They were gone in the first 5 minutes. Everyone loved them! Thanks for the recipe.